2013 년도 벌써 한 달이 지나고 2월을 맞이하게 되었습니다. 지난 1월에 뉴욕에서는 올해 첫번째 콘서트를 브롱스의 3-5세 장애아동 시설에서 열었습니다. 2월에는 뉴욕대학부속병원 여성장애인모임에서 아웃리치 콘서트 요청을 받아 처음으로 그들을 위한 콘서트를 엽니다. 서울은 2월에 삼성병원 강당에서 환자들을 위한 콘서트와 정인욱복지재단의 후원으로 열리는 시각장애인을 위한 콘서트를 준비하고 있습니다. 많은 격려와 후원 바랍니다. 서울과 뉴욕, 모두 한파가 몰아닥쳐 추운날씨가 계속 되고 있습니다. 여러분의 가정에 항상 따뜻함이 함께하시길 바라겠습니다. 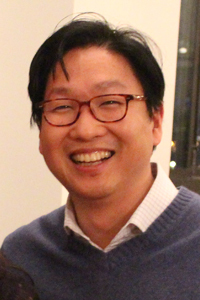 Chung In Wook Human Service Foundation’s English Camp. Your support will be greatly appreciated. 이 노비는 뉴욕 Bronx에 위치한 이스터 실즈의 아동발달센터 (Easter Seals Child Development Center)에 있는 3-5세의 장애를 가진 아이들과 봉사자들을 찾아가 클래식 악기로 구성된 프로그램을 선보였습니다. 이노비만의 클래식 악기로 구성된 프로그램을 통해 아이들은 흥겹게 뛰어 놀며 신체적 한계를 뛰어넘는 시간을 가졌습니다. 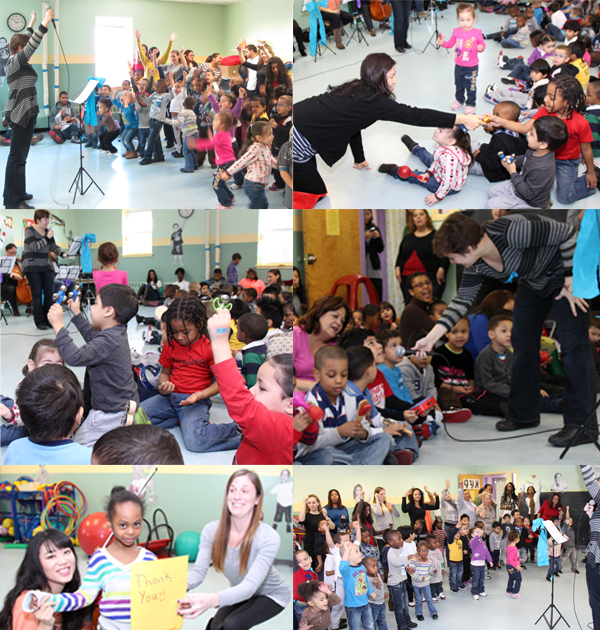 On Jan 24th, EnoB held a special concert for children between the ages of 3-5 at Easter Seals Child Development Center in Bronx, NY. These children with special needs had the opportunity to enjoy classical music and overcome their physical barriers by engaging in musical activities. 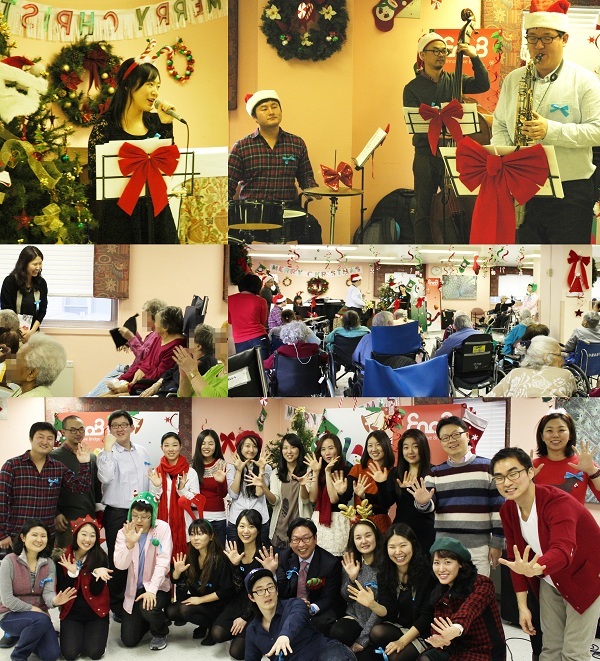 As requested by Consulate General Korea in New York, EnoB held a special Christmas concert in Mercy Garden, NJ. Musicians from Yale and the Juilliard performed carol and classical music for the seniors. 이노비는 뉴저지 지역에 있는 지적 장애를 가진 한인 어린이들을 위한 신나는 크리스마스 공연을 하고 돌아왔습니다. 언제나 항상 즐겁게 공연을 즐기고, 참여해주는 어린 친구들을 보며 더욱 마음이 따뜻해지는 시간이 되었습니다. 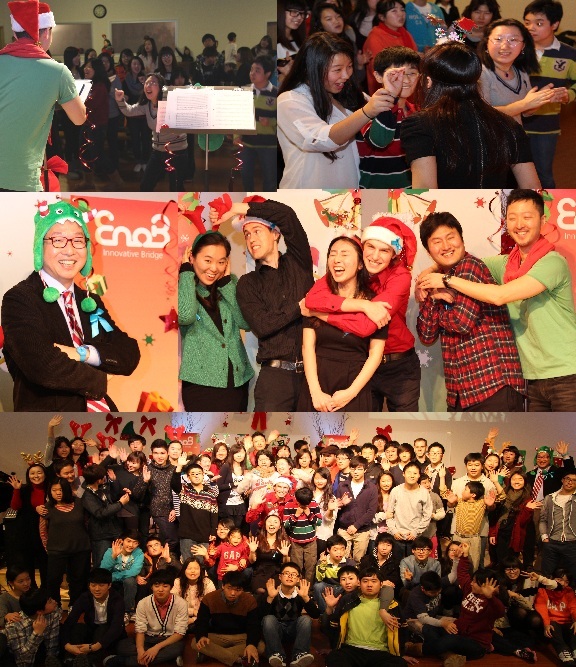 On December 22nd, EnoB held a Christmas concert for Korean children with special needs in NJ area. We were happy to see children enjoying the concert and dancing to the music. 휠 체어에 의존해 하루 하루를 외롭게 보내시고 계신 어르신들을 찾아가 이노비만의 즐거운 크리스마스 재즈 공연으로 행복을 전달해 드리고 온 이번 공연에는, NFC (New Frontier Church)에서 와주신 류인현 목사님을 비롯한 청년들이 함께 해주셨습니다. Last Christmas Eve, EnoB visited DeWitt Rehabilitation & Nursing Center and held a Christmas Jazz concert for the seniors. Folks from NFC (New Frontier Church) joined EnoB’s concert to share the happiness. 삼성서울병원 직원분들로 이루어진 ‘한가족의료봉사회’는 매달 자발적인 의료봉사를 나가는 동아리입니다. 지난 12월 17일에는 한가족의료봉사회 주최로 병원의 환자분들과 모든 직원 분들을 위한 크리스마스 특별 모임이 있었습니다. 이 자리에 함께 한 이노비는 연말을 병원에서 보내고 계신 환자분들과 그 동안 수고하신 직원 분들께 위로와 힘을 전해드리는 작은 공연을 선물했습니다. 소프라노 안수경님의 재능 기부로 아름다운 곡을 들려드릴 수 있었습니다. 웅진식품에서 이노비에 음료 후원을 해주셔서 이 모임에서 함께 나눌 수 있었습니다. 후원 감사합니다! On December 17th, One-Family Medical Service Team at Samsung Medical Center held a special Christmas gathering for the patients and staffs. 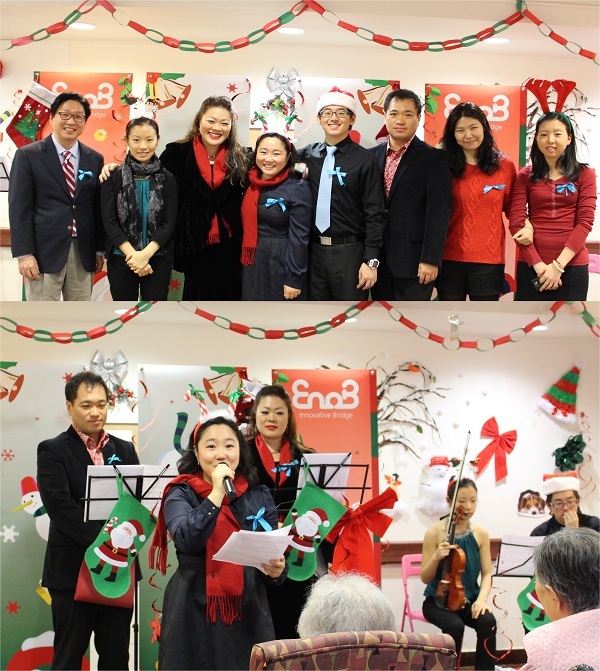 EnoB joined the gathering and held a small concert for patients and staff who are spending the holidays in the hospital. 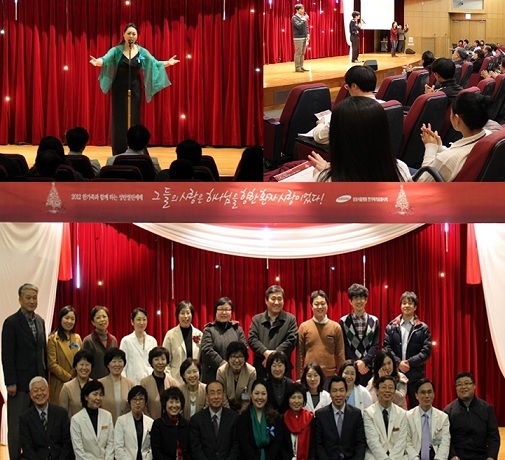 Soprano Soo Kyung Ahn shared her talent and Woongjin Foods donated beverages to make the holidays more meaningful for those who can’t be home. 이노비 인턴 유니스 한 님을 소개합니다. 유 니스님은 Boston University에서 경영학을 전공하고 있는 학생입니다. 미국에서 태어나고 자랐지만, 한국어를 더 배우고 싶어 한 학기동안 한국에 왔습니다. 5월까지 한국에서 지내며 연세대학교 한국어학당에서 공부하는 동안, 이노비에서 인턴으로 활동합니다. 유니스님은 이 곳에서 지내는 동안 서울을 경험하고, 인턴으로 일하며 한국어 실력도 향상시키고, 이노비와 함께 세상을 변화시키는 일에도 함께 할 생각에 기쁘다고 합니다! Eunice is a student at Boston University, majoring in Business Administration with a minor in History. Although born and raised in America, she is currently studying in Seoul, Korea until May to improve her Korean through Yonsei University’s Korean Language Institute. 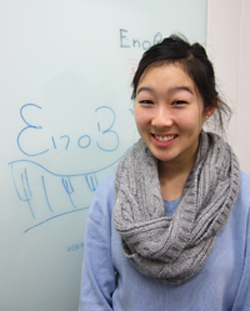 With an interest in non-profit organizations, Eunice wanted to get involved with EnoB. She enjoys the experience of interning in Seoul, practicing her Korean at work, and helping to make a difference through EnoB. 이노비 겨울 인턴 엄지인, 백봄 님을 소개합니다! 엄지인님과 백봄님은 계명대 KAC(Keimyung Adams college)에 함께 재학 중이며 학교 인턴 프로그램을 통해 뉴욕 이노비에 오게 되었습니다. 엄지인님은 국제경영학을 전공했으며, 평소 빈곤과 사회문제에 관심이 많아 예전부터 비영리단체에서 활동을 해 왔습니다. 백봄님은 같은 단과대에서 국제관계학을 공부하고 있으며, NGO의 경영과 공연 기획 등 에 관심이 많습니다. 두 분 모두 음악과 문화로 필요한 곳에 도움을 주고 있는 이노비의 활동이 감명깊었다고 합니다. 이노비에서의 인턴경험이 두분께 뜻깊고 보람있는 시간이 되길 바랍니다. 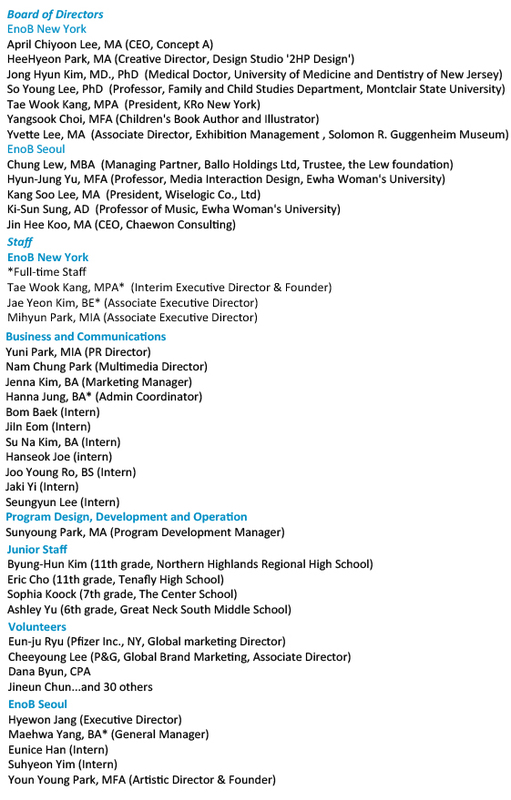 - Ji In Eom and Bom Baek from KAC (Keimyung Adams College) in Korea have joined EnoB through an internship program. Ji In Eom studied international business and has a great interest in poverty and social issues, and she has volunteered for NGOs in the past. Bom Baek currently studies international relations and is interested in management of NGOs and planning performances. They were especially moved by EnoB’s mission of helping people with music and culture. We hope this Intern experience at EnoB will be precious and meaningful to them! CTS 뉴스 동영상을 보시려면 왼쪽의 사진을 클릭하세요! Click to view the news video on the left side! 지난 1월 3일, 한국에서는 처음으로 이노비가 한국 기독교방송 CTS TV 저녁뉴스에 소개 되었습니다! 이노비의 아웃리치 공연 현장모습과, 강태욱 대표님을 비롯한 스태프와 뮤지션들의 인터뷰가 담긴 뉴스 영상을 통해, 이노비만의 음악을 통한 소통과 행복 나누기가 소개 되었습니다. 더 많은 분들이 이노비를 알게 됨으로써 함께 공유할 수 있는 행복과 나눔 또한 더 커짐이라 믿기에 이번 방송이 이노비에게는 기쁘고 소중합니다. 이노비는 앞으로 더욱 많은 활동으로 보답하겠습니다. 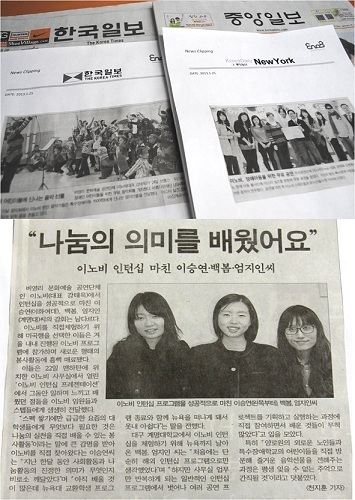 On January 3, 2013, EnoB's outreach and interviews were broadcast via CTS Television News for the first time in Korea. 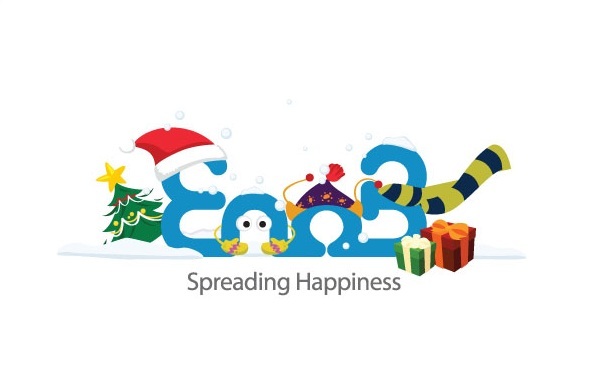 The news introduced EnoB’s Spreading Happiness through vivid scenes of outreach performances. We believe that the more people learn about EnoB and our work, the more happiness and benefits we can share with people around us. EnoB is grateful to have this special broadcasting opportunity and we hope to return the favor with more performances in the future. Over the last five years, EnoB has spread happiness to 4,500 program participants, and that number continues to grow! Of course, the musicians, artists, staff, and board members at EnoB do their best to fulfill their roles, but we couldn’t succeed without donors and volunteers. 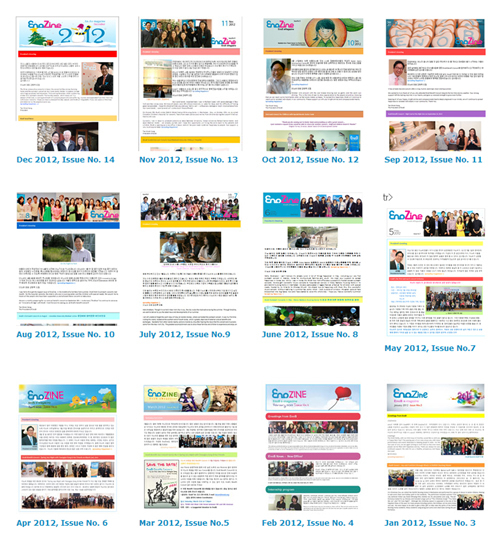 Please Click the Link if you want to see EnoB News Coverages. 의당기념사업회는 이노비가 서울에 첫 발걸음을 내디딘 2012년 5월부터 꾸준한 지원을 해주고 계시며, 일부 후원으로 11월 공연까지 열 수 있었습니다. *사진은 생전에 의당 유홍 선생님 이십니다. Mr. Yuhong was an activist for independence during the period of Japanese occupancy, and he began his political career from the constitutional assembly in Korea. The Lew Foundation was created in commemoration of Mr. Yuhong’s efforts, which were strongly based on the works of Christian missionaries. 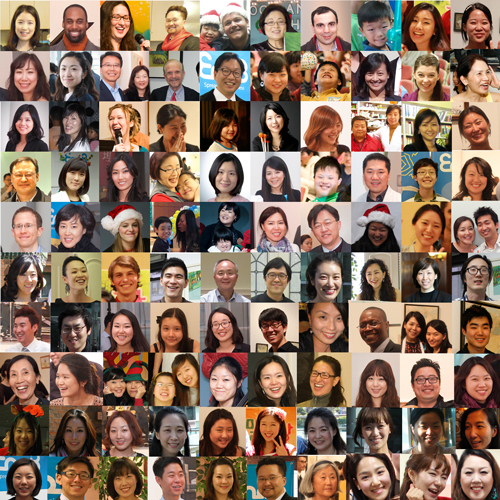 The Lew Foundation has supported EnoB since the opening of EnoB Seoul branch in May 2012. The generous sponsorship of The Lew Foundation enabled EnoB’s November concerts in Seoul. EnoB would like to express a sincere gratitude to The Lew Foundation. 삼성서울병원에 입원해 치료받고 있는 환자분들과 보호자분들을 위한 아웃리치 콘서트가 병원 본관 로비에서 열립니다. 힘든 투병생활 속에 지친 환자분들의 마음을 달래주고, 잠시 기분 좋게 함께 즐길 수 있는 콘서트를 준비하고 있습니다. EnoB will be holding an outreach concert for the patients and families at the Samsung Seoul Hospital. We hope to share the happiness to the patients who are battling illnesses. 2월 7일, 이노비가 이번에는 사우스 앰보이(남부 뉴저지)에 위치한 양로원인 은혜가든에 처음으로 갑니다. 그 곳에 계시는 한인 노인분들과 미국 노인분들께 마음을 달래드리는 따뜻한 음악을 선물합니다. On February 7th, EnoB will be visiting Mercy Garden in South Amboy for the first time and perform for Korean and American seniors. 2월 15일 NYU Langone Medical Center에서 여성장애인모임을 위한 공연을 합니다. 이 번 공연은 모임측의 요청에의해 나가는 공연으로 NYU병원에서 처음 열리는 콘서트입니다. 이번 공연은 헬렌 박님이 MD를 맡아 15-30세 여성장애인분들을 위한 특별한 콘서트를 마련할 예정입니다. 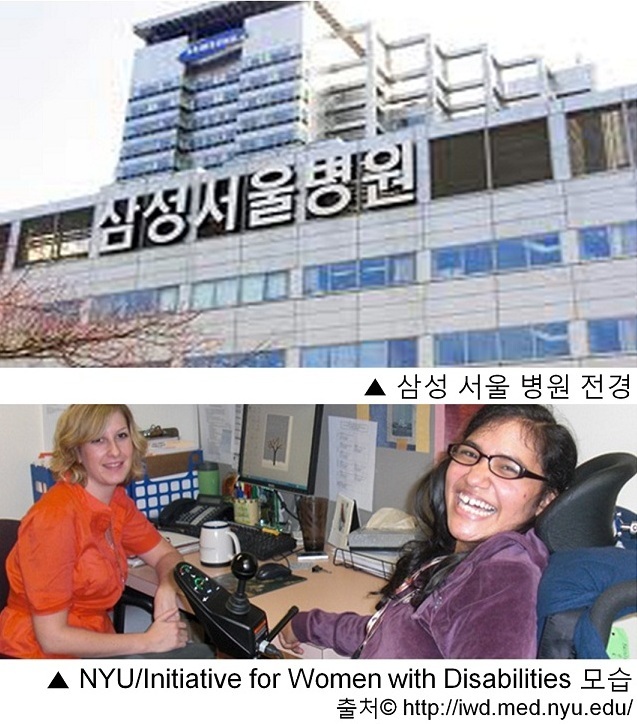 On February 15th, EnoB is holding a concert for the Initiative for Women with Disabilities at NYU Langone Medical Center. EnoB has been invited by the IWD to perform for women with disabilities between the ages of 15-30. Helen Park is our Music Director for this concert.